Help ensure fire door compliance in health care facilities! 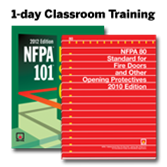 New NFPA® training helps you understand fire door inspection regs resulting from CMS adoption of the 2012 edition of NFPA 101®. The U.S. Centers for Medicare & Medicaid Services (CMS) adoption of the 2012 edition of NFPA 101, Life Safety Code® requires that health care facility operators conduct a yearly inspection of fire door assemblies in accordance with NFPA 80, Standard for Fire Doors and Other Opening Protectives. Help ensure your facility is prepared for CMS audits by knowing how -- and when -- you need to comply with NFPA 80 rules. Ideal for facility managers, this one-day course addresses the door types encountered along the egress paths within a health care facility, the door locking means permitted, the eleven verification points required for the yearly inspection of swinging fire door assemblies, and also addresses the knowledge and skills required to perform the inspection and testing in accordance with NFPA 80. You'll leave with the knowledge required to help ensure your facility's fire doors are in compliance with CMS mandates, and to assist your staff in knowing exactly what CMS surveyors will request during audits. Earn .7 CEUs or 7 hours for this 1-day classroom training. Attendance is required to earn CEUs. Please verify applicability with your professional board before attending. Apply the code TO your facility AT your facility! The premier training experience from NFPA: customized, hands-on instruction on-site at your workplace, administered by recognized experts who developed the codes and standards. For more information, contact us at 1-877-336-3280 or e-mail onsitetraining@nfpa.org, or visit nfpatraining.org/onsite. Ask for the National Fire Protection Association (NFPA) rate. We Develop the Code. We Know the Code. We Teach the Code. Bring NFPA® experts to your facility -- it's simply the best option when you need to enhance safety and improve the skills of 10 or more employees. Classes are tailored to your activities and work environment, scheduled when you need them, and convenient to your location -- reducing down time and boosting the productivity of your team. Expert Instruction -- Learn direct from the people who interpret, apply and help develop the codes every day. Every on-site Training is led by an NFPA fire and life safety specialist who is a nationally recognized expert. The Most Convenient Location...Your Facility! -- Time is valuable, that's why when you need to train upwards of 10 employees it makes sense to do it right at your facility where they work. We travel to you so you can keep your most valuable assets close to home. Relevancy -- The best training provides your team with knowledge they can apply as soon as they complete the on-site training. That's why we will work with you to put together a program tailored to your facility's installation, maintenance, or equipment needs. More Than Just Code Knowledge -- Step-by-step exercises and collaborative problem solving takes instruction beyond just knowing what the code says. Your team will develop skills to help them effectively respond to problems and enhance safety. Top-Flight Training Materials -- Packed with easy-to-follow diagrams, illustrations and examples, our workbooks are filled with exercises your team will consult and reference long after the seminar is over. Plus, we supply everyone with the latest edition of the applicable NFPA code or standard. Fully Accredited Programs -- Each attendee will earn valuable CEU's that will keep them up-to-date on their training. NFPA On-Site Training are accredited by the International Association of Continuing Education and Training, (IACET), the industry standard for quality and excellence in professional development programs. Hassle-Free Implementation -- Our Professional Development staff will take care of all the details for you. From the initial consultation and scheduling, to delivery of materials, and post seminar evaluations, we'll work to make your program worry free so you can concentrate on your business. Call today -- 1.877.336.3280 or e-mail onsitetraining@nfpa.org.